Towards the end of 2015 and far ahead of the BREXIT induced market downturn, investors began to seek the apparent safety of income yielding equities. The initial motivation for this seems to have been investors seeking yield outside of fixed income where yield seems hard to find in this low interest rate environment. The consequence of this pursuit of yield is the valuation of some of the defensive, income yielding sectors has been pushed to extremes. This move towards higher valuations has been exacerbated by the BREXIT outcome. One example of this is the utility sector. 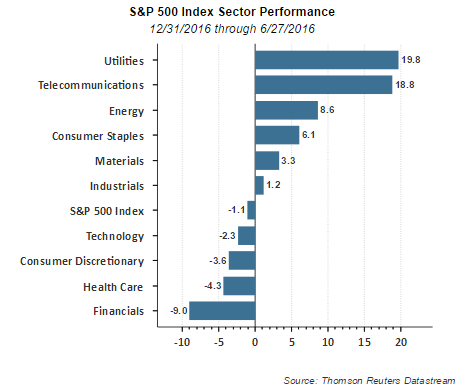 The below chart displays the performance of the S&P 500 Index sectors for the year to date period through June 27, 2016. Three of the top performing sectors are viewed as defensive ones and tend to be comprised of companies that pay and grow their dividends, i.e., utilities, telecom and consumer staples sectors. 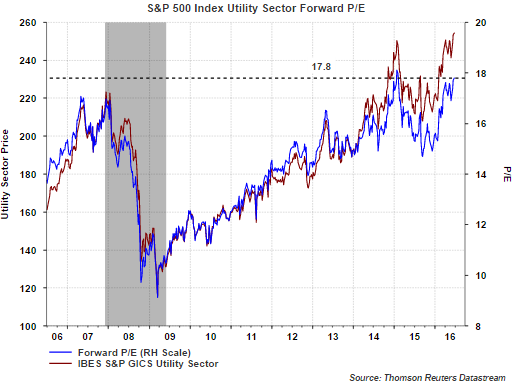 The top performing sector is utilities garnering a return of 19.8% so far this year. Other sectors such as consumer staples and energy also trade at higher valuations or P/E multiples as well. Yardeni Research ($$) updates sector valuations on a periodic basis and their most recent report can be read here. Sectors, and for that matter specific stocks, can remain elevated from a valuation perspective for an extended period of time. However, when rates rise and/or a more risk on equity environment returns, these defensive sectors are likely to underperform. S&P Dow Jones Indices and Factset recently highlighted the continued growth in cash balances for S&P 500 companies. A part of this cash growth has gone towards dividend payments and stock buybacks as I noted in a post yesterday, Stock Buybacks Up Double Digits In First Quarter, In Factset's report released today, they acknowledge the growth in cash levels; however, they also note the Cash to Debt Ratio for S&P 500 companies (ex-financials) has fallen to its lowest level since the second quarter of 2009. And back to utilities, six of the top ten companies with the lowest cash to debt ratios are utilities as can be seen in the below table. There is more to valuation than simply looking at cash/debt ratios, and utility rates are regulated and maybe more sustainable from that point of view, but higher demands on cash due to debt payments can become an issue for utility companies. Just last month Moody's downgraded the long-term senior unsecured rating of The Southern Company (SO)to Baa2 from Baa1 due to increased debt levels and lower cash flow coverage resulting from an acquisition. For investors pursuing investments in higher dividend yielding equity sectors, paying attention to valuations and coverage ratios is important. Additionally, not if, but when a risk on equity environment returns, these defensive, income yielding stocks could come under pressure. S&P Dow Jones Indices reports first quarter stock buybacks for the S&P 500 Index were higher by 12% on a year over year basis. On a quarter over quarter basis buybacks were higher by 10.6%. The increase in buyback activity was supported by a quarter over quarter 15.8% increase in as reported earnings. Disappointingly though was the fact QOQ dividend payments declined 3.1%. Additionally, the combination of dividends and buybacks equaled $257.65 billion and was in excess of reported earnings of $189.11 billion. This is the six straight quarter buybacks plus dividends exceeded reported earnings. The Health care sector increased 86.1% to $30.6 billion for the quarter, up from the prior quarter’s $16.5 billion, as Gilead Sciences (GILD) spent $8 billion (ranking as the 18th largest in S&P 500 history). The Energy sector conducted only minor buybacks ($2.1 billion), as it posted a 20.6% decline for the quarter and a 62.9% decline from Q1 2015. 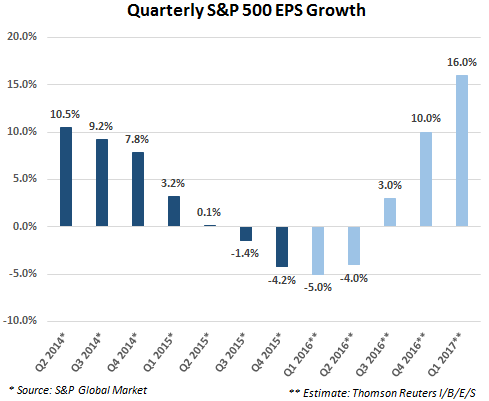 For the ninth consecutive quarter, more than 20% of the S&P 500 issues reduced their year-over-year diluted share count by at least 4%, therefore boosting their earnings-per-share (EPS) by at least 4%. The participation rate for significant EPS impact rose to 28.2% for Q1 2016, up from 25.8% in Q4 2015. Total shareholder return, dividends plus buybacks, set a quarterly record of $257.6 billion in Q1 2016 and a 12-month record of $974.6 billion for the period ending in March 2016. Howard Silverblatt, Senior Index Analyst at S&P Dow Jones Indices. 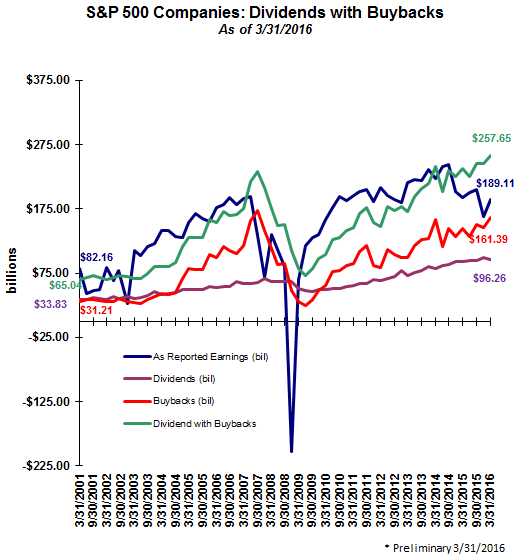 said, "The Q4 2015 uptick in buybacks was a surprise to many in the market, but it continued in Q1 2016. The pace of buybacks was partially driven by companies supporting their stock during the opening downturn of the year, which coincidentally started in early February when many earnings lock-ups ended. The upswing in both expenditures and participation appears to persist in the market, meaning that the upturn in Q4 was not single-shot. Looking at Q2 2016, the share count reduction trend is already baked in, as more than 20% of the issues have reduced their share count by at least 4% from Q2 2015." Silverblatt also noted in the report cash reserves set a new record and increased 1.6% to $1.347 trillion. "Shareholder returns continue to increase, as companies remain awash with cash and have access to low-cost financing – especially in Europe and Asia," said Silverblatt. "The rate of dividend increases has slowed, as commodity-based issues remain a major uncertainty. Given the current cash-flow, projections, and an expected slow and measured pace of interest rate increases in the U.S. by the FOMC, companies have the ability to increase returns, as they remain under continued pressure from outside investors." From an investor perspective, at HORAN, we prefer to see companies commit to higher dividend payments versus just an increase in buybacks. Dividends tend to be a more permanent commitment on a company's part and an indication of more consistent expected earnings 'growth', where buybacks can be turned off and on at will. Much is being written regarding the impact of the United Kingdom's exit from the European Union and all the conclusions lead to uncertainty. It is the uncertainty equity markets do not handle well, thus, the sell off on Friday. One conclusion I believe is certain is the world will not come to an end and business will continue to be conducted between EU and non-EU countries. This is a wakeup call for the EU and its seemingly unending promulgation of rules and regulations that seem to favor some EU member countries over others. On paper the formation of the EU seemed like a good idea; however, a monetary union without a fiscal union has led to a lack of spending discipline by some countries. And, no real spending discipline is a symptom not only of EU countries, but with non-EU countries as well. The United States can be included in the 'no discipline' crowd too. Our firm will have more commentary on the Brexit outcome later. The damage done to global equity markets on Friday is pretty clear. The Nikkei was down 7.9%, S&P 500 Index down 3.6%, the Dow down 3.4%, the French CAC Index down 8.0%, Spain's IBEX 35 Index down 12.35% and the UK's FTSE 100 Index was down 3.2%. The unknown is what additional weakness can be expected in global equity markets over the next weeks and months ahead. In earlier blog articles, I have noted past crisis events and their duration and time to recover. Below is a chart from a June 28, 2015 post. Some of the crisis influenced market declines bottomed after one day while other declines took place over a longer period of time. The average decline in terms of days was six with an average return of -5.3%. The sentiment technicals for the S&P 500 Index are indicating fear is elevated. 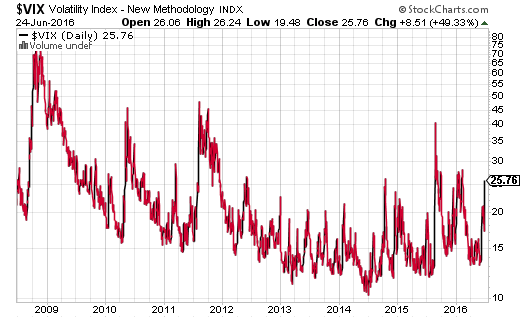 Historically, when the fear measure like the VIX is elevated or the equity put/call ratio is above one, these levels have coincided with near market bottoms. 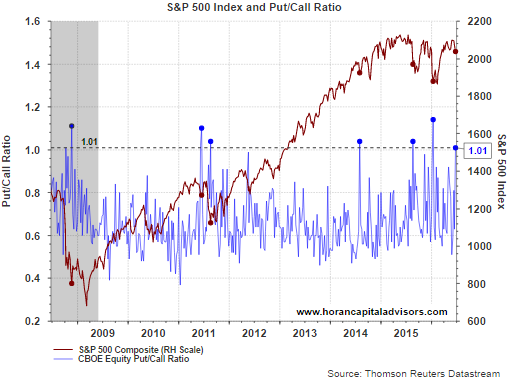 The first chart below shows the CBOE Equity Put/Call ratio spiked above 1.0 on Friday. The VIX futures went into backwardation on Friday as well. VIX backwardation refers to the situation when the near-term VIX futures are more expensive than longer-term 3-month VIX futures (VXV). 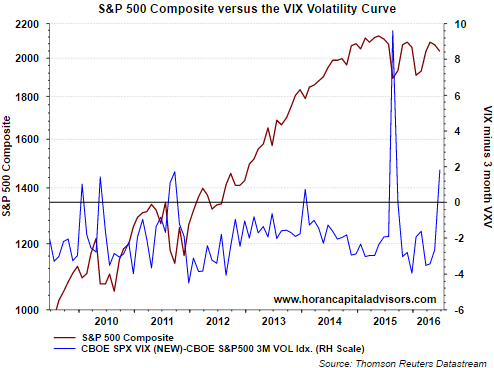 This is an indication traders expect volatility in the future to be lower than it is now. Historically, when this occurs, short term market rallies tend to result from this technical event. 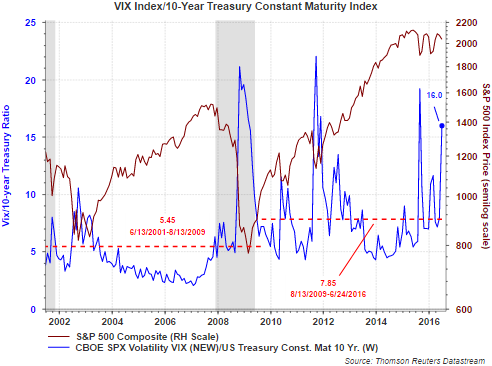 The other sentiment measure that is indicative of an oversold market is the ratio of the VIX to the 10-year U.S. Treasury yield. The low level of the denominator of this ratio, the 10-year Treasury yield, is indicative of a slow growth economic environment and investors' propensity for risk off assets; hence, driving the yield lower. The numerator, the VIX, is elevated thus, an indication of investors' fear of the equity markets. An expected certainty in this Brexit inspired uncertainty is the fact the markets will continue to be volatile. Of importance is whether or not this event pushes Europe into a recession and drags the U.S. into one along with it. What makes this a heightened issue is the slow, bump along growth, of the U.S. economy and the slow economic growth globally. The added uncertainty is whether or not Brexit leads to additional EU countries taking steps like the UK's and then the ultimate breakup of the EU. The world is not coming to an end and this Brexit induced equity market pullback will likely provide investors with a buying opportunity in equities that have been unduly punished. 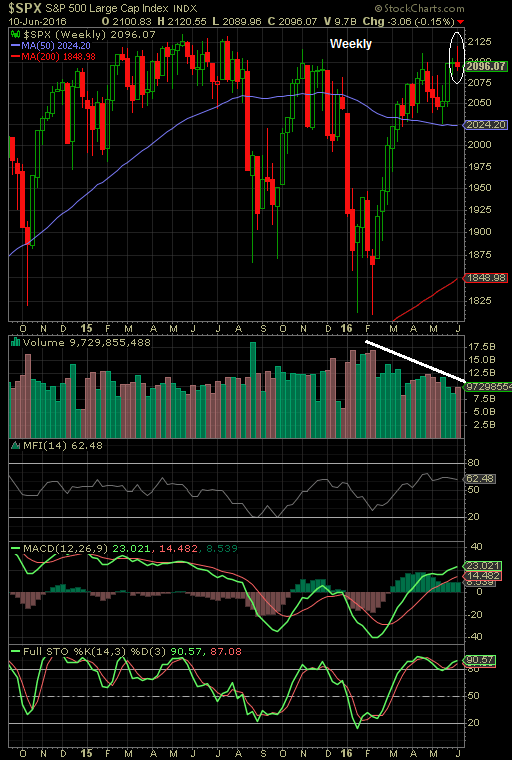 Quite a bit of discussion circulated after the market closed on Friday surrounding the S&P 500 Index and the resulting weekly chart candle that formed for the week. As the below candle stick chart clearly shows, a shooting star formed out of the weekly market action. One factor making this formation of interest to technical market traders is it occurrence subsequent to a strong market uptrend and the previous weekly candle was an indication of pretty strong uptrend. 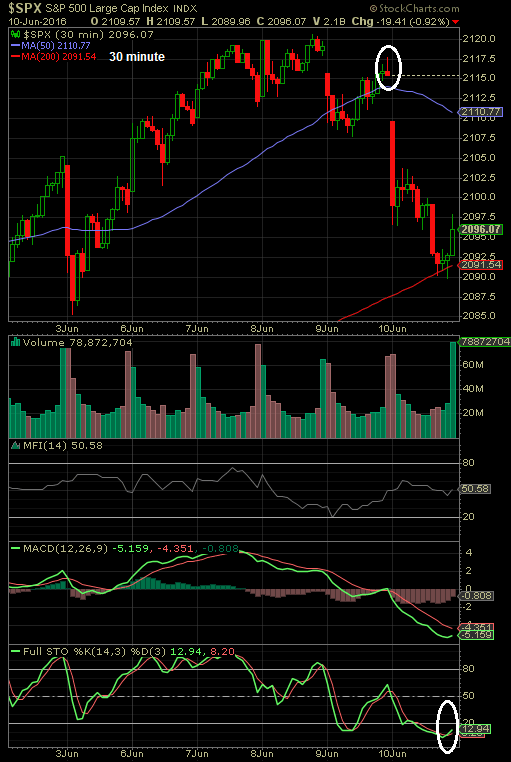 So, this shooting star is viewed as a bearish signal since sentiment has changed so dramatically. Downside market follow through is needed though in order to confirm a potential market reversal. A couple of factors that may counter this bearish formation is the fact volume on down weeks has been declining. Equally important is the fact volume on up weeks has been declining as well. From a positive standpoint, the chart pattern on a 30 minute chart shows buyers came in during the last hour and a half of trading. This resulted in the market bouncing off the 200 period moving average. 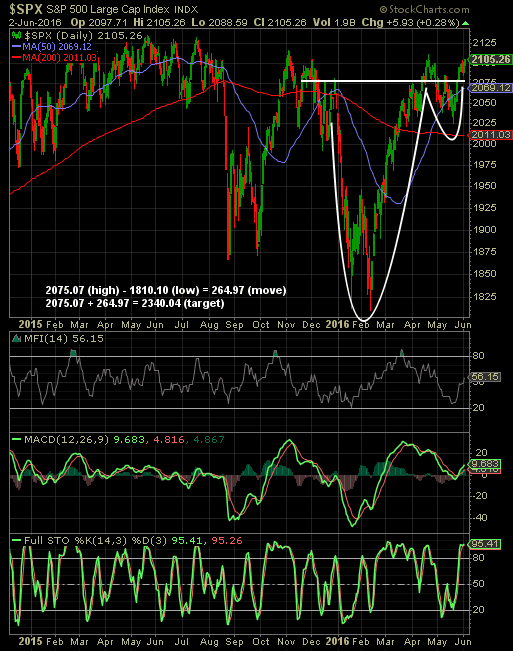 The market has a tendency to fill gaps created in chart patterns and a gap above formed with Friday's lower open. 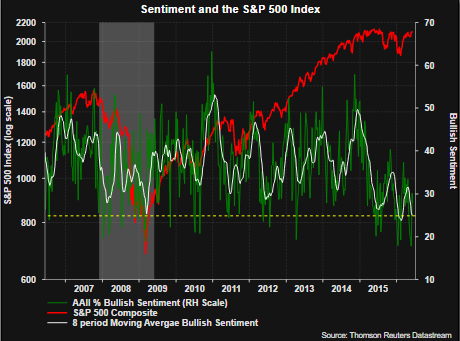 From an investor sentiment perspective, the individual investor remains skeptical of the market's rebound from the February low based on AAII's Sentiment Survey. 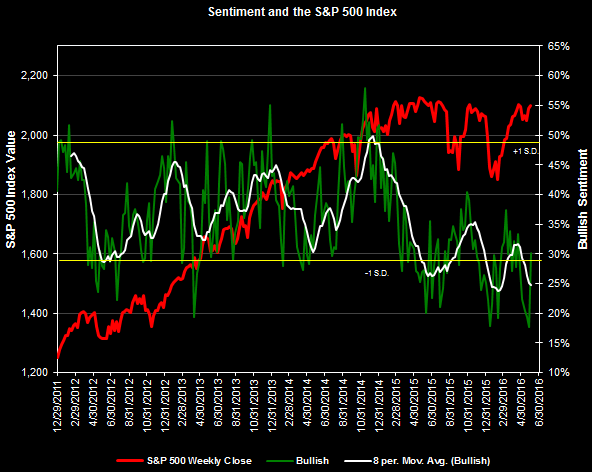 The 8-week moving average of bullish sentiment is at a level coincident with a market bottom. 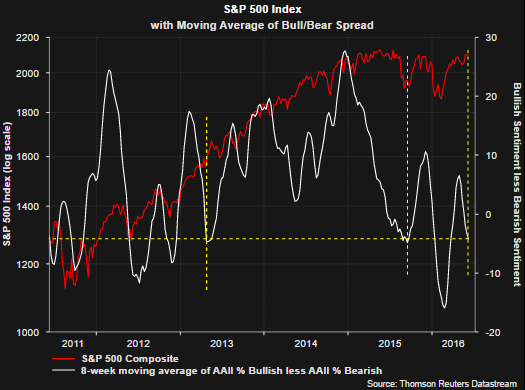 And lastly, reviewing the bull/bear spread that is reported with AAII's Sentiment Survey, the below chart shows the 8-week moving average of the spread compared to the S&P 500 Index. The level of this average of the bull/bear spread is also at levels associated with a market that is nearing a turn to the upside. The above analysis is all based on technicals and the market certainly needs to digest other issues, like a Fed rate hike and the BREXIT vote on the 23rd of this month. From a sentiment perspective, and given the contrarian nature of this measure, investors may be too heavily tilted to bearishness. On the other hand, the technicals are giving off mixed signals and combined, these are likely to lead to continued market volatility over the next several weeks. With the weak nonfarm payroll report on Friday, heightened concern arose about the pace of economic growth or lack thereof. Pundits and market indicators believe a Fed rate increase in June is off the table. A weak payroll report is an indicator of a weakening economy and certainly the trend in nonfarm payrolls has been a declining one. This declining trend has been in place over several months, +233,000 in February, +186,000 in March, +123,000 in April and +38,000 in May. Determining what this means as investors look ahead for the balance of the year is important. I believe Scott Grannis provides good insight on Friday's report and implications for the months ahead in his post, No Improvement in the Jobs Market. The weak payroll report comes on the back of some weakness in the manufacturing data. For example, in late May the Durable Goods report saw core capital goods orders decline a .8%. However, there are some bright spots in a few of the manufacturing reports. For example, Econoday noted, "There are...solid points of strength in the report including 0.6 percent gains for both total shipments and total unfilled orders. 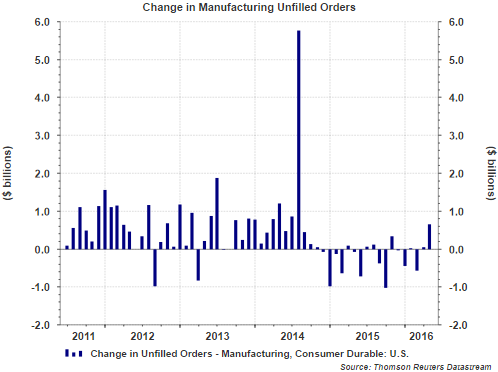 The gain for unfilled orders is the largest since July 2014. Another plus is a 0.2 percent decline in inventories which pulls down the inventory-to-shipments ratio to a leaner 1.65 from 1.67. A graph of the unfilled orders chart is below. A small positive is the fact unfilled orders have increased in three of the last four months. The consumer accounts for about 70% of economic activity (GDP) and their health is critical to economic activity. In this regard, there are many positives with consumers overall. 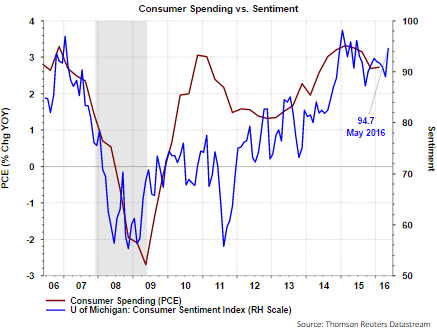 University of Michigan Consumer Sentiment: The May sentiment survey showed an increase of 5.7 points compared to the April report. The May report noted, "consumers became more optimistic about their financial prospects and anticipated a somewhat lower inflation rate in the years ahead. Positive views toward vehicle and home sales also posted gains in May largely due to low interest rates." Retail Sales: The positive consumer sentiment report also carries over into retail sales. The favorable report was spread across many of the categories, autos up 3.2%, non-store retailers (e-commerce) up 2.% for the month and up 10.2% versus April last year. Overall for April, retail sales were up 1.3% and up 3.0% on a year over year basis. The next retail sales report comes in about ten days. This growth in retail sales is evident in the below chart. 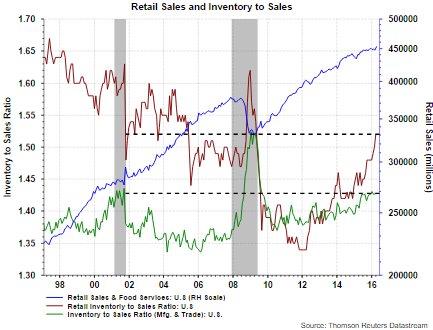 A cautionary observation is the rise in both the retail inventory to sales ratio and the manufactures inventory to sales ratio. On the positive side, the above noted durable goods report indicated inventory of manufactured durable goods is down in nine of the last ten months which has pulled down the inventory to shipments ratio. A final question revolves around how are consumers financing this spending. Clearly, the below chart shows borrowing has been an important source of funds. 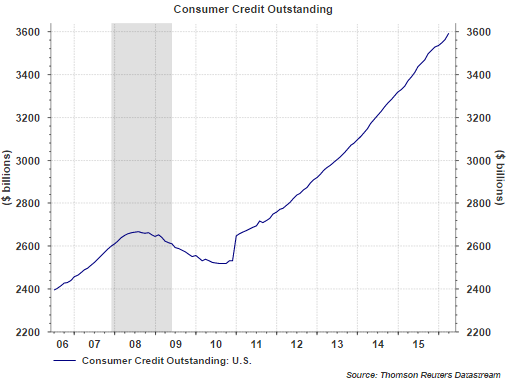 This increase in consumer credit outstanding certainly raises the question of the ability of these consumers to repay their debts. 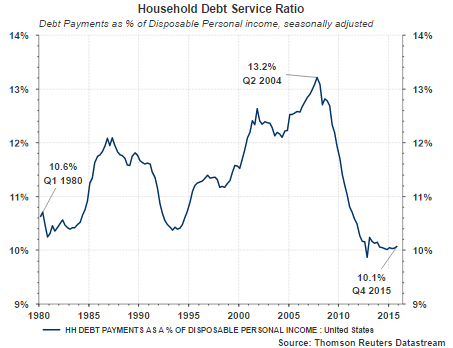 Positively, debt payments as a percentage of disposable income remain at levels seen in the early 1980s and down from the 2004 high of 13.2%. Manufacturing sector growth has slowed to a snails pace as well. In our view this has become the norm in this subpar GDP growth economy. 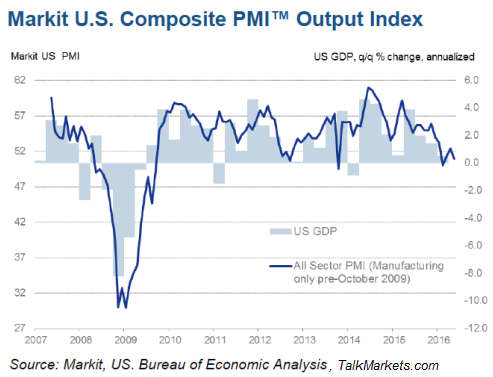 As the below chart shows, the Composite PMI is near contraction, not unlike the economy has experienced a number of times since the end of the financial crisis. In summary, Friday's payroll report probably puts the Fed on hold for a rate increase this month. Reading the Grannis article mentioned in the opening paragraph places Friday's report in proper perspective. Data suggests the consumer is on pretty sound footing and they are responsible for more than two thirds of economic activity. Given the consumer is a fairly good shape, we believe this factor provides support for continued economic growth, albeit subpar growth. On top of all of this is the fact consumers, businesses and investors will continue to face election year rhetoric that most likely leads to continued market volatility. However, a recession does not seem in the cards at the moment.